GCQ is organising Diwali Celebrations with FREE ENTRY. The celebrations is included with Kids Activities, Rangoli and Cultural performances, Power pack dances and Diwali Fireworks. 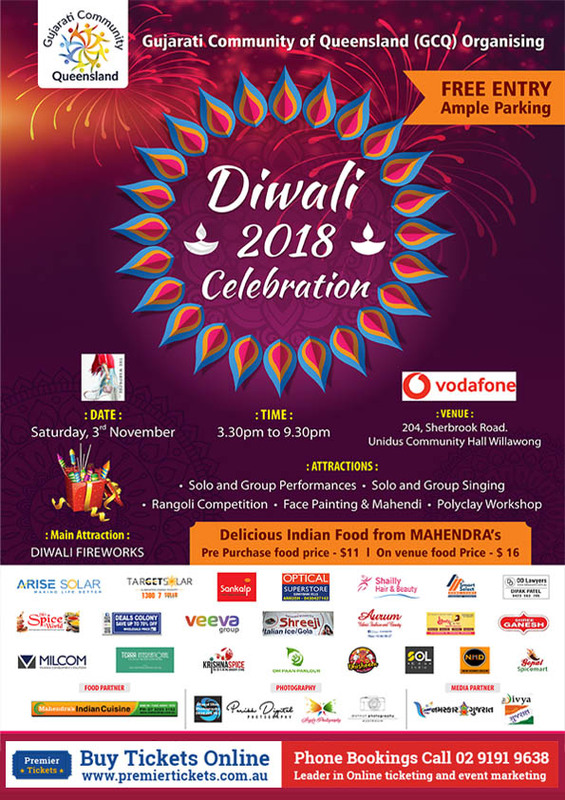 There are many stalls available to purchase Diwali related items. Delicious Dinner from Mahendra’s Restaurant. Pre book your dinner and get discount. “No Onion & No Garlic” Food option is available For that you need to put a note during booking - Limited Stock Only. Premier Tickets is an online event marketing and ticketing agency. Premier Tickets will NOT be responsible for any changes related to the event schedule, artist, venue or cancellation and refunds related to the tickets for Diwali 2018 Celebration.